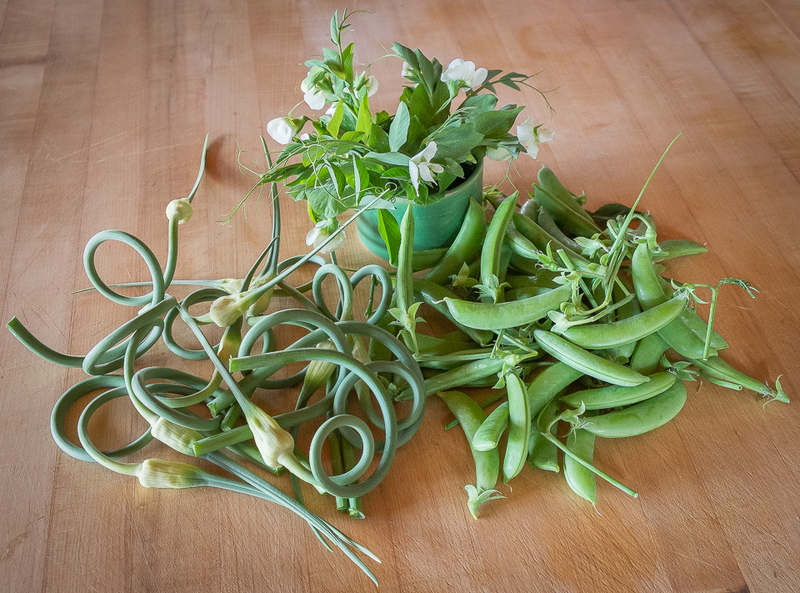 In these long days around the summer solstice, pole beans and winter squash, pea vines and garlic stalks are lengthening themselves to match the days, stretching and twining, sending out tendrils, twirling and looping into fantastic shapes. 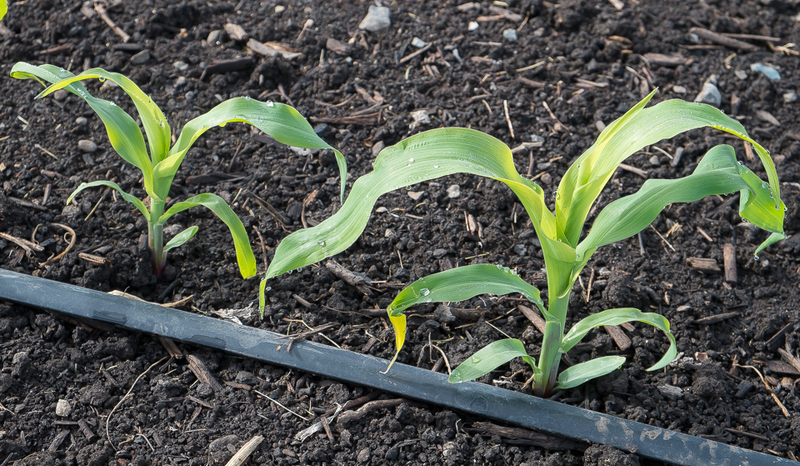 Responding to sun and warmth and longer days, these vegetables have begun their serious growth. We’ve made it past the uncertain weather of spring and summer is really here. 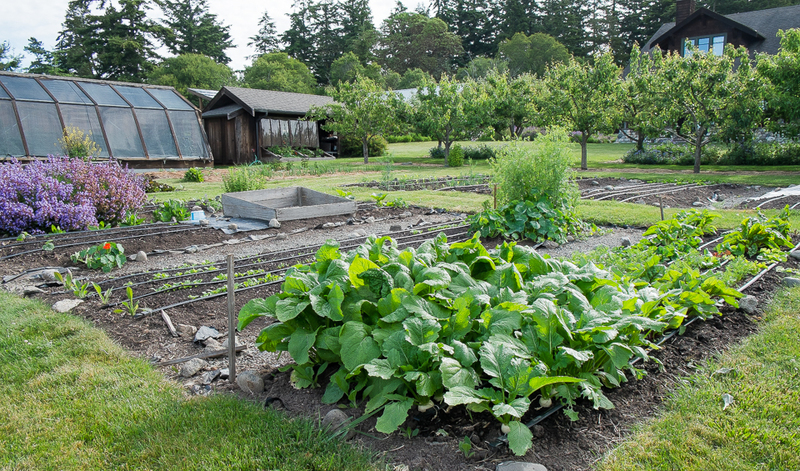 It’s a lovely time to wander in the garden. 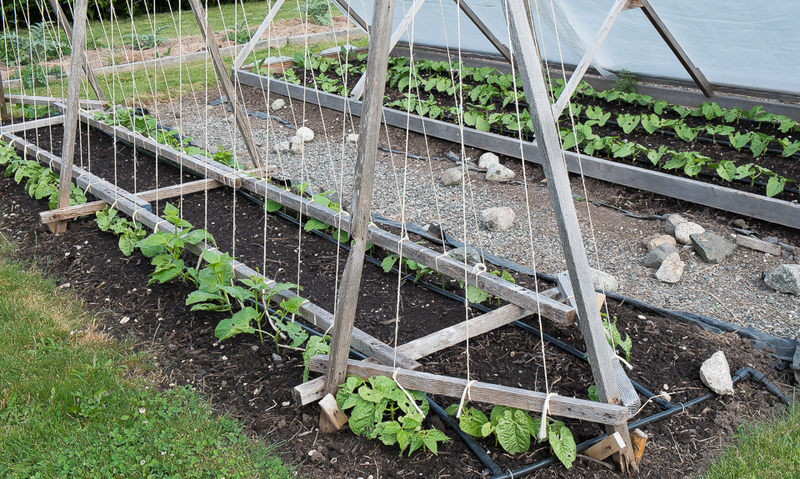 On the sisal strings of the pole bean trellis, leaves are spreading open along the twining vines and will soon cover the entire structure. 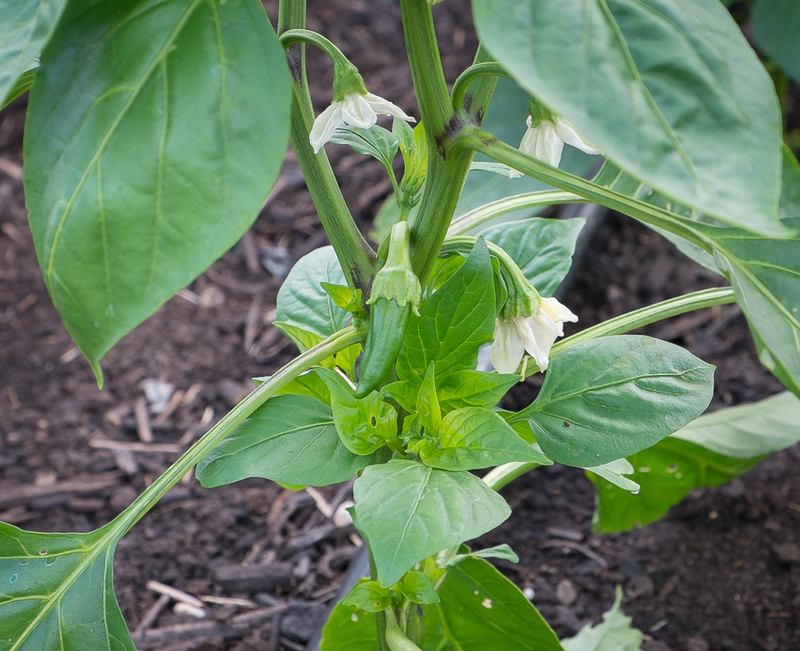 White, pink and scarlet blossoms will join the green of the leaves before giving way to dangling pods. 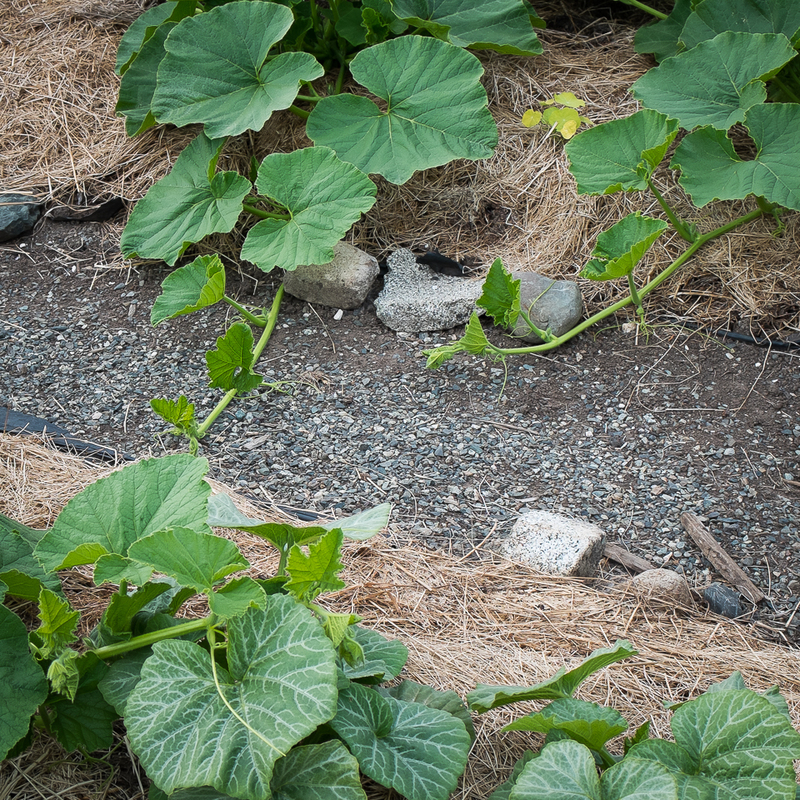 Squash vines are reaching beyond the borders of their beds and will soon carpet both paths and beds with giant leaves, then blossoms in shades of white and yellow and finally swelling orbs of squash. 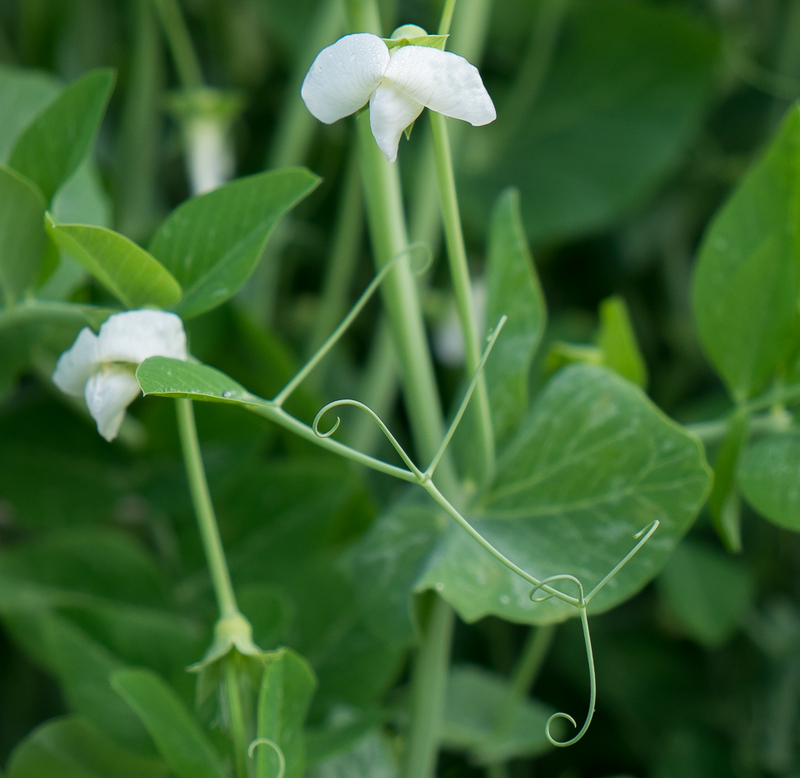 Peas are producing now, the first crunchy sugar snap pods ready to enjoy raw or sautéed. 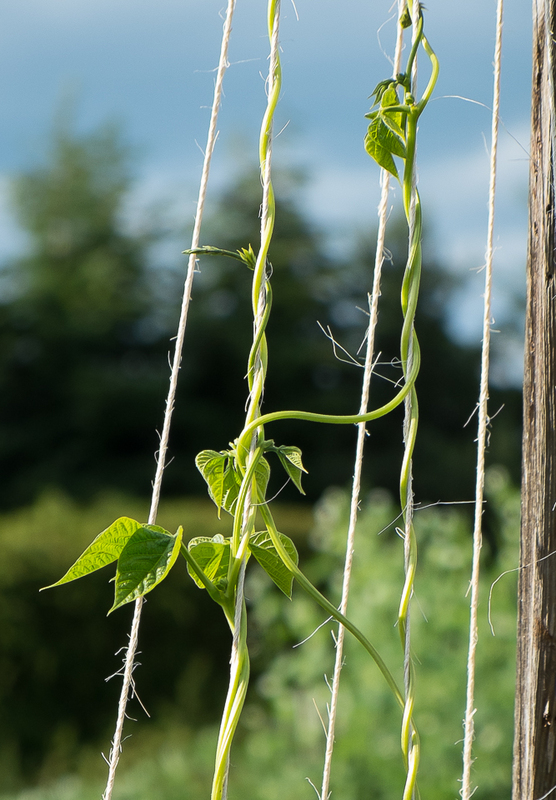 Their blossoms and climbing tendrils continue to grow upward, lovely to look at and also delicious to eat. 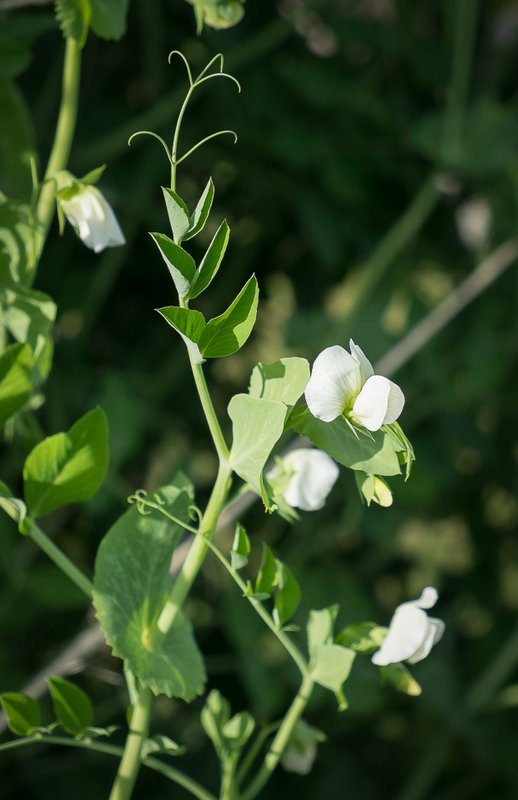 We’ll have more peas than we can keep up with so harvesting a few vines and blossoms and sautéing them along with the pods adds beauty and variety to dinner. In another month we can do the same with squash blossoms and late vines. And finally the garlic stalks rising above the soon-to-be harvested bulbs have been creating the most whimsical show of shapes in the early summer garden. 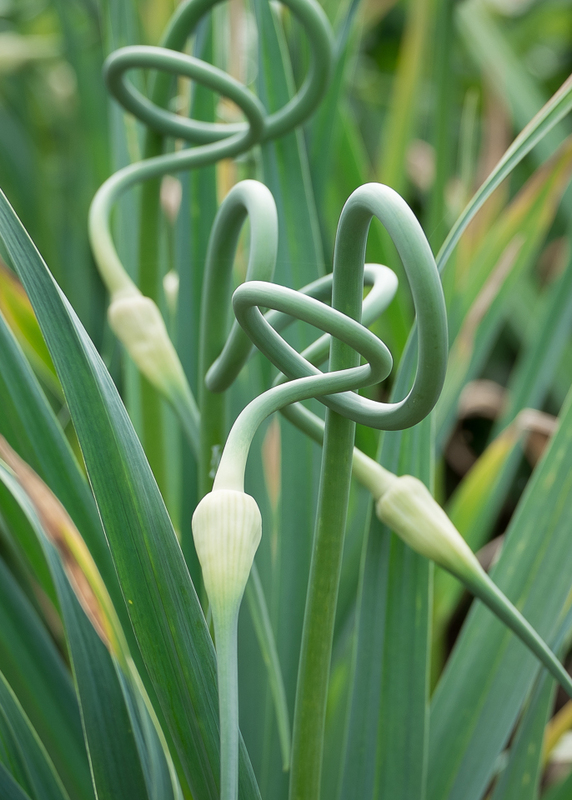 Called garlic scapes, these seed heads of hardneck garlic are not only a delight to observe, each one different from its neighbor, they are also a delicious garlicky treat. Some cooks make a pesto from the raw scapes but we find the resulting sauce too garlic-hot. Lightly steamed, though, the scapes are really delicious, like a sweetly garlic-flavored green bean. 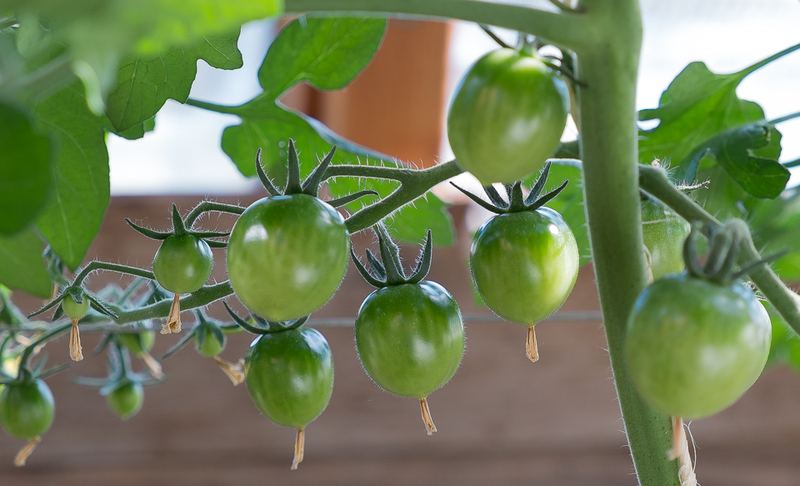 We eat them alone as a side dish or mixed in with other spring vegetables, peas, carrots or turnips. 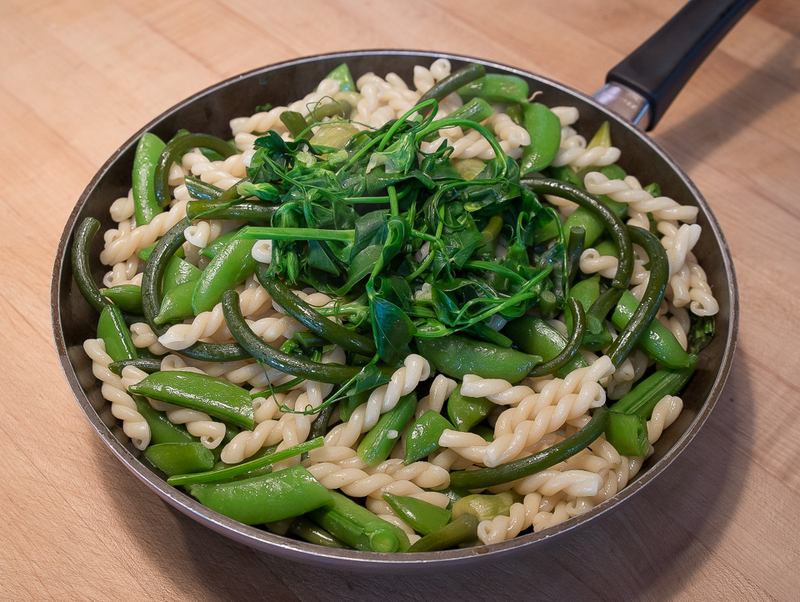 Last night, garlic scapes, peas and pea shoots mixed with pasta for a summer dinner. Looking ahead to July and August, the garlic will be harvested in the next few weeks, then the peas will wind down as the beans come in and the winter squash will take on colors of rich green and deep orange, but for now, in these days just after the solstice, we’ll enjoy the special beauty of the early summer kitchen garden.